When government gets into the development business, things often do not go exactly as planned. That happens for any number of reasons. Some are legitimate. Some are not. But there is always a reason or an excuse for why it happened. That last one only makes sense when you are spending someone else's money, but it gets used on occasion. The recent post about potential development on Davidson’s Main Street, specifically the so called “Catalyst Project” being driven by Davidson Town hall garnered some feedback from Commissioner Rodney Graham. He made a couple of good points on the upcoming changes to the town planning ordinance as well as the Catalyst Project that deserve mentioning. That's definitely good to hear. Davidson is known for its strong commitment New Urbanist planning principles, and over the years it has done a very good job of protecting Main Street from development that doesn't “fit” with that Norman Rockwell, small-town image people have come to associate with the town center. The examples of the two-story CVS and the Stowe Building at the south entrance to the “postcard” section of town are regularly held up as examples of the Town sticking to its guns in the face of possible unwanted change. However, those are different animals all together than what the Catalyst Project could become – a transformative project in an area that has tried really hard to change as little as possible. That the Catalyst Project could change what it means to go to downtown Davidson is undeniable when the town is talking about bringing some combination retail, office space, multifamily housing, and a large parking deck to the area adjacent to its “postcard”. Even if the town is not building any of the actual buildings, is “guiding” and encouraging that much development something the town really wants to be doing? Also, if things go wrong how much will be taxpayers be on the hook? Will the project end up like the NASCAR Hall of Fame built by the City of Charlotte which just had the City asking for a bailout from its lenders due to poor attendance? Or, will the project end up like the Huntersville Town Center built with the intention of spurring revitalization of the old downtown area? 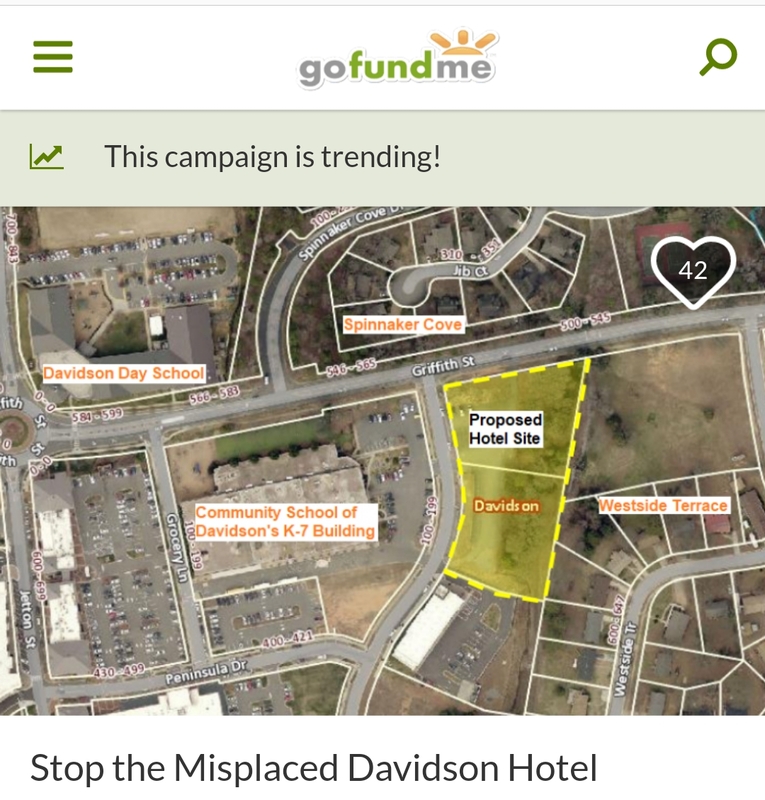 That project cost the town $19 million, but has had limited impact on additional development. One thing that does not bode well for the Catalyst Project, is that the stated demand according to town hall, does not seem to mesh with what’s happening on the ground. At the recent presentations on the project, economic development director, Kim Fleming, talked about regularly turning down requests for space in the downtown area. That sounds promising. However, when I asked (twice) for a list of commercial projects over the last year that have been unable to find space in the downtown area, the answer from town economic development director, Kim Fleming, was that no such list exists. Moreover, two blocks down the street at South Main Square you’ll find that nearly all of the commercial space lies empty in the live work portion of the complex. Further out from town center you'll see things like the “for lease” signs above RushCo at Exit 30. The town has also floated a preliminary proposal to convert the planned live-work units in the Bradford neighborhood to affordable housing rentals. Granted, these may not be comparable examples to the demand for small-space commercial in Downtown Davidson, and I am sure they will be explained away as such. However, they are examples of the town “guiding” commercial development in ways that have been less than successful. Let's hope if the town ends up guiding development in a way that transforms Main Street, they don't have to look for any of those same excuses. This Thursday, WFAE a Charlotte Talks will host a panel discussion on HOT Lanes with Wideni77.org's, Kurt Naas, going head to head with Robert Poole of the Reason Foundation - a libertarian think tank in California. Charlotte City Councilman Al Austin will also be on the panel. For those paying close attention to the HOT lanes debate Poole's name may be vaguely familiar. He was recently quoted in the lake Norman Citizen calling the WidenI77 lawsuit against the HOT lanes project a "nuisance suit". If you've been a long-time reader of this blog, you may remember the below pice as well. This is a common practice of the big money in these big transportation projects. If any opposition gets traction, the "experts" are summoned to aid in the defense. It happened with the transit to repeal debate in 2007 when the pro-repeal side warned of an out of control spending plan that would need more money. It also happened in 2012 when the Red Line commuter rail project was going through its most recent attempt to get going, and it's supporters were hocking a pie in the sky finance plan. finance plan has suffered an ignominious death. Both of these transportation plans were put together by "experts". Remember that when you hear Mr Poole on Thursday. HOT lane usage...Bait and switch coming? The 10 second version of the HOT Lanes sales pitch sounds pretty positive, but a look behind the curtain says the fast talking salesman is prepping his mark for the old bait and switch. HOT lanes will reduce congestion. Some users will be able to ride for free. The road will be open to all comers. "Robert W. Poole, Jr. is the director of transportation policy and Searle Freedom Trust Transportation Fellow at Reason Foundation, the free market think tank he founded. Poole, an MIT-trained engineer, has advised the previous four presidential administrations on transportation and policy issues. In the field of surface transportation, Poole has advised the Federal Highway Administration, the Federal Transit Administration, the White House Office of Policy Development, National Economic Council, Government Accountability Office and state DOTs in numerous states. Poole coined the term HOT Lanes. He is one of the field's leading experts. Yet, his paper says the only way to effectively manage HOT lanes like the ones proposed for I-77 is to effectively do none of the things tossed out in the HOT Lanes 10-second sales pitch. The I-77 project is actually described as a HOT 2.0 facility where tolls will finance the actual construction of much of the project. (The small HOV conversion portion being the exception.) As a HOT 2.0 effort, toll collection and enforcement become vital to the success of the project. They are critical because they are used to actually pay for the construction of the road. To ensure these critical needs are met, changes from the promises of the "sales pitch" are necessary for the project to meet it's funding requirements. Instead of "reducing congestion" for all travelers, we get a "congestion-relief lane" for those willing to pay a premium. Instead of "some users get to ride for free", we get a system designed to reduce the number of free riders by as much as possible. According to Poole, 83% of vehicles on existing HOT 2.0 projects pay tolls. That's compared to 35% of riders on HOT 1.0 lanes which are entirely converted HOV-2 facilities. Instead of "the road being open to all comers", we get proposals from Mr Poole that only pre-registered and audited carpoolers should be allowed to use the lanes for free with all others needing some sort of transponder. These proposals don't come from people opposed to HOT lanes or tolls in general. These proposals don't come from people who have a vested interest in seeing these projects fail. These proposals come from the person who coined the term HOT and who is one of its biggest supporters. But Mr Poole didn't coin the term HOT 2.0. No, according to Mr Poole, that honor goes to David Ungemah. If you would like to hear Mr. Ungemah, he'll be participating in the HOT 2.0 sales pitch this Wednesday at the Lake Norman Transportation Commission meeting in Mooresville - 7PM at the Charles Mack Center. Just remember, as with any sales pitch it isn't always representative of what they are truly trying to sell you. It has been called a bribe, a sweetener, and an incentive, but its official name is the “bonus allocation”. The word you use to describe this pot of money likely depends on whether or not you support the I77 HOT Lanes project. Regardless, a lot of taxpayer money is in the process of being planned and approved if the HOT project overcomes financing and legal hurdles to move forward. Earlier this month, a group called the Technical Coordinating Committee (TCC) provided a draft list of projects to the Charlotte Regional Transportation Planning Organization (CRTPO) for spending the “bonus allocation” from NCDOT for having the HOT lanes project instead of new general purpose lanes. According to Bill Coxe, Huntersville’s transportation planner, the recent TCC action “was to forward the list of projects that would use either bonus allocation or direct attributable funding to CRTPO for ‘review and consideration’ and did not make a formal recommendation. That will occur at the March 5th TCC meeting.” Coxe also said he “would not be at all surprised to see changes at that time." That's good to hear because the current list leaves a good bit to be desired. Again, regardless of what you call this pot of money or whether or not you support the HOT Lanes project, since citizens are going to be stuck with toll lanes for 50 years under the current plan, one would think the money should go primarily to those who are going to be stuck paying the tolls. Unfortunately, the current list seems to have lost track of that point. Here is the breakdown of proposed project costs by municipality: Huntersville $44.5m , Cornelius $42.7m, Statesville $30m, Charlotte $23m, Mooresville $15.7m, Davidson $5.2m with a miscellaneous $5m thrown in for studies not attributable to any single town. The total of $166.6m for the 22 projects on the list is greater than the expected available funding of something closer to $158m, so some trimming or changes are likely. However, one of the projects on the list is definitely raising eyebrows. That would be the $30m project to add direct access ramps to the HOT lanes from the bridge at Stumptown Rd in Huntersville. The concern is that this project pprimarily helps tolling contractor Cintra rather than local residents. I asked Huntersville Commissioner Rob Kidwell about his concerns on spending Bonus money for a HOT direct access ramp. I also checked with Cornelius Commissioner Dave Gilroy for his take on this proposed use of bonus funds. Gilroy said “the logic of using ‘Bonus Allocation’ dollars to help build the toll lanes project itself is utterly asinine. In fact, such an allocation underscores the cynicism and thoughtlessness with which NCDOT has planned this tolling project from the beginning. These "Bonus" dollars are meant entirely as an incentive to local citizens to help make-up for the tens of thousands of dollars in personal toll expenses which routine users of I-77 will incur in the coming years. NCDOT's consultant Stantec projects that local families, with at least one daily commuter to Charlotte, will incur over $400 per month in new expenses within the first few years of I-77 tolling. That's a body blow to working class families. For NCDOT to then apply "Bonus" incentive funds to the very same project helps nobody other than NCDOT and toll road operator Cintra. This is insult on top of injury for local residents." Strong words to be sure, but there is another project on the draft list that should maybe worry taxpayers even more. That’s the $3m “feasibility study” for even more direct access points which would require further additional cost to taxpayers for the benefit of Cintra. Before this HOT lanes project even gets the first shovel in the ground, it’s true cost is starting to balloon above its $655m price tag. With the new General Assembly barely underway, multiple bills have already been submitted that put State lawmakers and some local government officials on a collision course over local authority to make some planning decisions. S25(H36) - Zoning/Design and Aesthetic Controls was submitted last Tuesday. That was followed by Wednesday's H51 - Justice for Rural Citizens Act. S25 and its companion bill, H36, are carryover bills from previous legislatures. The legislation has never been passed mostly due to timing on the legislative calendar, but it has raised angst among local officials every time it has been discussed. The bills submitted last week match versions from the 2013 session that received overwhelming bi-partisan support. Republican Senator Jeff Tarte from Cornelius is a primary sponsor on the Senate side – the same as he was last time. The bill would explicitly prevent municipalities from implementing regularions on single family homes such as designating specific external building materials or design restrictions such as minimum setbacks on garage doors. When this legislation was being discussed in 2013, the Town of Davidson took the unusual step of asking citizens to contact their legislators encouraging them to oppose it. When asked if the Town would do that this time around, Public Information Officer, Christina Shall said "we will likely ask citizens to contact their representatives to oppose these bills, but we are waiting for the appropriate time." Davidson Commissioner, Rodney Graham, who is also a custom home builder, was specific as to why he opposed this legislation. Graham said "this legislation is being promoted by the production home builder lobby, and I have no idea why Raleigh feels they are better equipped to legislate design considerations than are the local towns." When asked about this concern regarding local control of these decisions, Senator Tarte had this to say. "The purpose of the aesthetic controls bill is to clarify where municipalities have inappropriately reached beyond their sphere of control as originally intended by the General Assembly. Nothing more and nothing less." That sentiment meshes with comments received from Charlotte Mayor Dan Clodfelter. In 2013, then-Senator Clodfelter - a Democrat - was also a primary sponsor of this legislation along with Senator Tarte. We asked Mayor Clodfelter's office if his feelings had changed now that he is on the municipal side. Interestingly, he said we could use the same colorful quote he gave back in 2013 regarding the legislation as well as a study called a Health Impact Assessmenr opposing it completed by Davidson staff. A collision course with Davidson would seem to be set on this one. The second potentially controversial bill entered last week, H51 - The Justice for Rural Citizens Act, will also no doubt cause major heartburn for elected officials used to having their way with local planning decisions. H51, if passed, would strip municipalities of their Extra Territorial Jurisdiction (ETJ) planning authority. Currently, municipalities can have some level of land use control beyond their municipal boundaries. H51 would remove that authority over land use in an ETJ while leaving authority over public safety and things like water/sewer in place. The rational is simple. Residents from ETJs can not vote in municipal elections, so municipalities should not have a say in how their land can be used. Again in Davidson, while town officials would certainly oppose seeing their authority over the town's ETJ stripped away, not everyone would be sorry to see it go. Former Davidson Planning Board member, Martha Jenkins, had this to say when asked about the bill. "The ETJ is a terrible and unfair restriction for property owners outside of town limits. Property owners in the ETJ are subject to people making decisions on land uses – while the actual property owner has no voting rights for those people who make those decisions. This concept allows town officials to control zoning and land uses without giving regard to the people who own the property and pay taxes." She went on to say "the ETJ concept contradicts the American ideal – all citizens should be allowed to vote for decision makers." If this bill goes forward, after decades of living in Davidson's ETJ, Ms Jenkins and others may finally see that contradictory situation remedied. We recently told you about Dish Network's new Sling TV OTT service, and its possibility to impact Mi-Connection. Well, that day is finally here. Sling TV opened to the public on Monday with an a few more offerings than originally announced. How much more space they have under their $20/month price tag to add additional channels will be something to watch closely. The most common criticism of Sling TV is the limited number of channels, but with the addition of channels like AMC, that criticism could diminish rapidly. AMC has the most popular show on cable - The Walking Dead. If channels like FX and Fox News are ever added, this new service could become truly transformative. Below outlines what has been added for launch. AMC will be added to the $20 per month core. package. “Sports Extra” pack now available for $5 per month. This includes: the SEC Network, ESPNEWS, ESPNU, Universal Sports, Univision Deportes, beIN Sports, ESPN Buzzer Beater, ESPN Bases Loaded and ESPN Goal Line. These channels have been added to your reviewer account. WatchESPN now available at no additional cost to all Sling TV customers. Maker Studios’ Polaris+ channel coming soon. More closed sessions for Davidson's Town Board? Davidson's Board of Commissioners will head back into closed session during the "Pre-Meeting" before Tuesday's regular monthly meeting at 6pm. See full agenda here. This will be after the Board met for nearly three hours in closed session before canceling their last public work session on 1/27. Over the past 6 months, Davidson's Board of Commissioners has made going into closed session the rule rather than the exception. Over the course of 12 meetings dates covering the monthly regular meetings and work sessions, the Board has gone into closed session 10 times. The Board has had a lot on its plate recently under categories that could be discussed in closed session away from the prying eyes of the media and the public. However, just because you can do something doesn't always mean you should. State law provides for very defined exceptions that allow closed meetings for elected officials. Generally they fall into the classifications of personnel issues, real-estate dealings, and legal issues covered by attorney client privilege. Policy discussions do not qualify. With Davidson involved in multiple lawsuits it's possible that all of these closed sessions are covered by these exceptions, but it's also likely that in these discussions policy discussions could take place. In years past, the Board had used the tactic of meeting in small groups with the Town Manager to avoid the State open meetings laws. We commended the new Board when it got rid of that practice as a step towards more open and transparent government. The furry of closed meetings seems to be a step in the wrong direction. “Davidson’s Main Street embodies quintessential Americana, bursting at the seams with both local character and historic charm. Much more than an assemblage of quaint brick sidewalks and historic architecture, Main Street is the nexus that binds the community together...Norman Rockwell could not have imagined a more charming small town street. Main Street also operates as Davidson’s front door, literally welcoming visitors to peruse the town’s local shops, sample locally-grown goodies from the farmers’ market, stroll along the town green, or enjoy a nice dinner in one Davidson’s many independent restaurants. Now, two short years later significant change will likely be coming to Main Street as private sector development picks back up after the Great Recession and the Town itself contemplates getting into the development game. The recent demolition of the old Davidson Clinic on South Main made apparent that some activity was in the works for that location. According to Interim Town Planning Manager, Jason Burdette, a substantial project should be expected. “While I have not seen any drawings of the project as the applicant has yet to submit, my understanding is that they are planning to develop a four-story storefront building with residential above,” Burdette said. The site is nearly two and a half acres, so it could handle quite a sizable building. If the project goes forward it will, likely be the first in an area under the Town’s new zoning designation of Village Edge. However, that designation appears to not be what is driving this particular proposal. According to documents provided by the Town, discussions have been underway with development firm, Island Holdings Group LLC, since Spring of 2014. Additionally, Burdette says “this type/height of building is already permitted at this location under the current Village Center Planning Area”. However, that does not mean the potential for a large project on the Southern end of Main Street is not already having an impact. Documents provided by the Town show additional property owners interested in having their property re-zoned as Village Edge under the proposed new planning ordinance due to the possibility of a large new multi-family complex in the neighborhood. While additional re-zonings may make sense they will also contribute to changing the character of this entrance to Davidson's Main Street area by allowing for additional large scale development. “Large” being a subjective word at this point. Multiple emails for this story to Island Holdings Group regarding the number of expected residential units for the Davidson Clinic site went unanswered. However, a building with three to four stories of apartments could easily mean several dozen residences if not more. And while the possibility of major change at the south end of town may seem significant, they pale in comparison to what the Town itself is pursuing in the heart of Main Street. Since the middle of last year, the Town has been working with consultants from the UNC School of Government to assess what could be done with several Town-owned parcels including and around Town Hall. The effort called the Catalyst Project could very much change what Davidson’s town center becomes in the years ahead. The idea behind the Catalyst Project is to enter into some form of Public Private Partnership with one or more developers to build a combination of parking, retail, office space, and possibly additional residential units. The thought being that the development would support additional Town needs such as expanded parking and more office space for fire, police, and Town staff while requiring relatively low direct investment of additional Town funding beyond providing the land itself. At a December 4th presentation, three main scenarios were presented to the Town Board. All three could raise eyebrows as residents become more familiar with them. All of the preliminary scenarios envision a 400 space parking deck on the lot where the Davidson Farmers Market now takes place. Only one of the three scenarios maintains the parking lot next to Town Hall which could be used as a possible new location for this weekly event. Two of the scenarios envision residential units in buildings sitting adjacent to the current town hall. One has to wonder at the viability of residential so close to an active fire station which would still be housed at the same location. Each scenario also raises long-term questions about how the town would fund any improvements if that is necessary and what level of risk would the Town be exposing itself to in the event the project did not go as planned financially. With Davidson's history of getting involved in private sector enterprise via Mi-connection, residents should be particularly wary about how this project could impact the town beyond just what it could do to Main Street. With that in mind, residents need to ensure they take full advantage of upcoming opportunities to give feedback. The first opportunity to do that for the Catalyst Project is today, Thursday 2/5 at 7pm at Davidson Town Hall. Davidson residents should stop by. The future of your Main Street may depend on your involvement. An earlier version of this piece appeared in the latest edition of the Harold Weekly. This last weekend, I finally had a chance to watch the Scott Walker speech at the Iowa Freedom Summit. If you haven't seen it, check it out here. After you do, you'll have no problem seeing why the Wisconsin governor surged to the lead in the Desmoines Register polling for the 2016 GOP caucuses. This poll was conducted right after the Freedom Summit and ended just before Mitt Romney officially dropped out of the race last Friday. As such, it provides a few interesting glimpses into where things stand exactly a year out from the kickoff of the primary season. Walker tops the list of candidates at 15% - one point ahead of Rand Paul (14%), but a full 7 points ahead of Jeb Bush (8%). Walker achieved this lead while having 34% of respondents say they were "unsure" of where he stood ideologically. That was the highest unsure rate of any leading candidate, so he has more room to move. My guess is his numbers will improve even more as people get to know him. When Romney's votes are reallocated to his poll respondents' second choice candidates, Jeb.Bush only bumps up 1%. Mike Huckabee actually garners more Romney supports - picking up 3% of Romney's initial 13%. The fact that Bush received so little of the Romney vote shows a significant weakness among more establishment voters. It also makes Romney the king maker in this race. Who he picks to support will be interesting to watch. So, why would Walker make the best GOP candidate to face Hillary Clinton? He would hit right at the Achilles Heel of the Democrats - white working class men. The Democrats have been struggling nationally with this demographic and Walker will appeal greatly to them. While not as nationally known (yet) as some of the other candidates, he is known among the activist class, and he boasts a national donor base among that class due to the publicity around his taking on the teacher unions and the subsequent recall vote they launched against him. He has been vetted better than any other Republican candidate. Walker was the number one target of the far left nationally during his recall and reelection campaigns. They have thrown everything possible at him and he survived twice. No other candidate can boast that type of record. Again, watch that video of his Freedom Summit speech. Scott Walker is the one to watch in this crowded GOP field - at least for now.